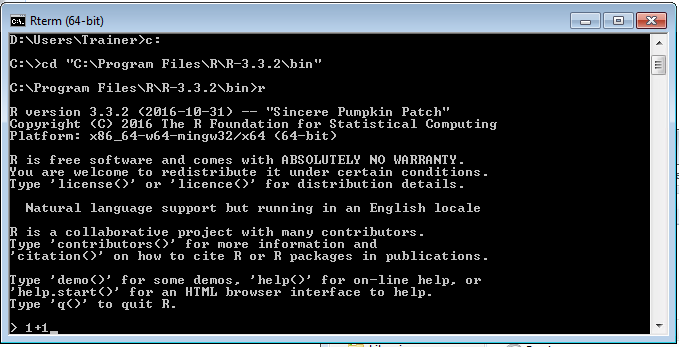 2) Issue commands to the R Console. This Blog entry has shown a simple line of script being written, executed and returned by R. Although rudimentary, it is an R program. · y: Save the workspace image for reloading. This will keep everything in the current session. · n: Clear the workspace so that the next time r is loaded it will be afresh. · c: Cancel and go back to the workspace. Notice that an error was returned ‘Unable to open .Rhistory’. The error is created as the operating system will not allow the user to write to the same directory as R is running, which introduces the concept of working directories, as follows.